I’m usually not one to wear a lot of skirts and dresses, but for this skirt I make an exception! I was so excited to find the motivation to sew up a Cleo Skirt (designed by Made by Rae)! It had been a pattern I had been eyeing up for a while. Letting it simmer on the back burner was actually a good thing as I was able to fully commit to my fabric choice and feel good about getting started on it. There’s something about waiting to see a pattern in different fabric choices and styled different ways that makes me feel like I can make them for my wardrobe. Sometimes it all clicks into place once you see it being worn a certain way or in a particular color or fabric type. 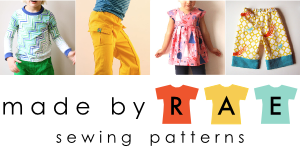 I think that’s why it’s so easy to love Rae’s patterns. She always does an amazing job of showcasing her own makes and also sharing those of others. Combine that with Indiesew and I think you couldn’t get a better match. Indiesew carries both the PDF and paper formats of this pattern PLUS Allie almost always stocks beautiful fabrics that would be just perfect for this skirt (see a couple of links below)! And I have to mention that Indiesew has a great feature of makers showcasing their work for each pattern. If you scroll down to the “Creations” tab for each pattern you can view what everyone has been making. To me that’s pretty much the best thing ever. No need to hunt down inspiration because it’s all right there. I know finding time to sew is a luxury for many of you, so I think you’ll love that feature! I feel like when I wear this skirt that it’s even comfier than wearing jeans and a t-shirt. The elastic waist and pockets of the skirt make it comfortable and useful. I think I pick my outfits mostly around the fact if they have pockets or not. So even though I think I look dressed up — I don’t feel dressed up! Well, maybe aside from the heels, those I can only wear for a few hours at a time. Pattern: Cleo Skirt by Made by Rae available in both PDF and paper formats in the Indiesew shop! This black Gabardine would be amazing (in fact I just ordered some myself) and this Challis would be so pretty, too as a Cleo skirt! Pssst! I’m wearing my Jade shirt with it too, check out that blog post with all the info here. Jade is available at Indiesew as well! This post was written as part of the Indiesew Blogger Team. All opinions are my own. It looks great and so comfy too! So cute. I love this, and your fabric is amazing Anna!